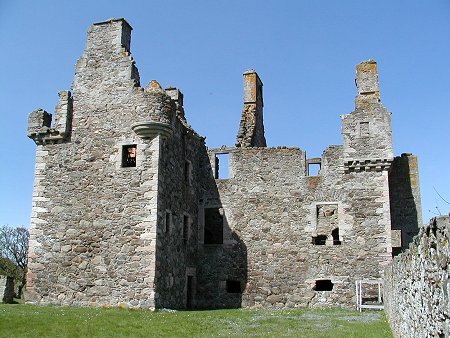 Glenbuchat Castle is currently closed because of unsafe masonry, though the castle may be viewed externally. For the moment the remainder of this page is as written before the closure took place. Glenbuchat Castle is located on a bluff above the River Don. It was built in 1590 for John Gordon of Cairnbarrow and his wife Helen on the occasion of their wedding. 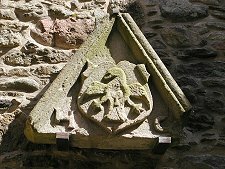 This is recorded in the stone above the entrance together with the motto "nothing on earth remains bot faime", or "nothing lasts without good repute". Glenbuchat is an excellent example of a "Z" plan castle. 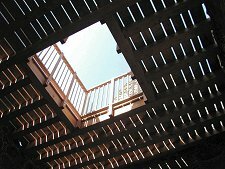 This means it has one main rectangular block, with two smaller rectangular blocks placed at opposing corners of the main block. 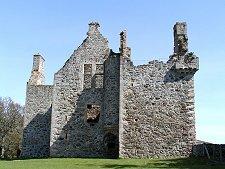 Glenbuchat Castle is roofless above the first floor, but it is otherwise well preserved and you can gain a good idea of the layout and the accommodation it provided. Much work has been done of late restoring the main spiral staircase to the upper levels of the castle and installing an excellent wooden viewing platform occupying much of the space across the central area. 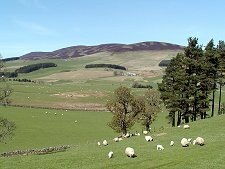 However, Glenbuchat is one of Historic Environment Scotland's usually unmanned properties so you are unlikely to be able to access this platform or, sadly, the views it offers over Strathdon and Glen Buchat. You reach the castle up a narrow track from the main A97. From the car park at the head of the track you make your way through the gate and across the field to the castle. To gain access, you go round the castle and into the grassy courtyard between it and the farmstead to the south. The only entrance, as usual with castles of this sort, is set into an angle so that unwanted visitors can be dealt with via gun loops in two walls. 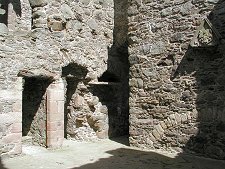 The castle offers visitors a chance to explore the first floor in its entirety, plus a full complement of vaulted ground-floor rooms below, though to see some of them a torch is recommended. Glenbuchat, sometimes known as "Glenbucket" at the time, remained in the Gordon family until 1738. 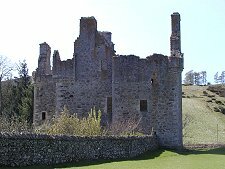 The Gordons were strong supporters of the Jacobite cause and the castle was visited by the 23rd Earl of Mar en route from his home at Kildrummy Castle to his muster point at Corgarff Castle at the start of the 1715 uprising. After its sale in 1738 the castle fell into disrepair. It was purchased by James Barclay in 1901 who started to restore it, and it was placed into State care in 1946. In 1948 The Deeside Field Club bought the parkland surrounding the castle and passed it, too, to the State, ensuring that the castle's surroundings would remain as attractive as they are today. 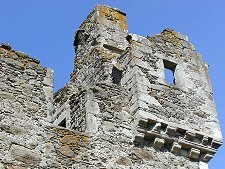 The castle is looked after by Historic Environment Scotland.